Chemistry may not be your cup of tea, but it is everywhere you look and has many practical applications. Besides, you can’t graduate college or high-school without taking science classes. Chemistry is not actually that hard to get started with, but you are going to have to know your table of elements before tackling any other topic. 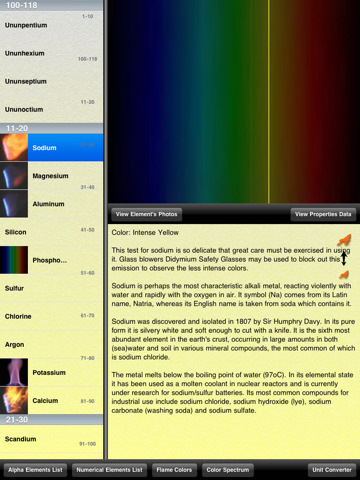 Table of Elements Pro is just an app for that. It has a ton of videos, pictures, and information to help chemistry students master the table of elements. Table of Elements Pro offers you something no paper table of elements can offer. It contains information on electron properties plus electron schematic/configurations. It even has color spectrum chart. The pictures and videos included in this app can be helpful too. 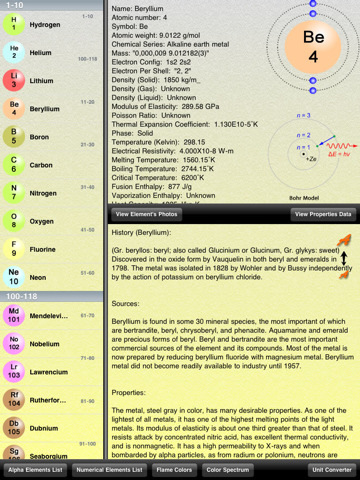 What I like about this app is the fact that it’s very interactive and has a ton of information on elements (information that you need to know to tackle those complex chemistry problems). The app does not take too much space (relative to other comparable apps) which is always a plus. It could probably a bit less pricey, but Table of Elements Pro does a good job when it comes to education in chemistry.